Alleluia! Easter is not just about Jesus rising from the dead. His rising from the dead is certainly what we celebrate, is the singularly most important event in the history of all history. But what makes Jesus rising from the dead so earth-shattering is what it means for us – both for our present lives and our eternity. We no longer need be held captive by our death. “The power of his death once confronted our death. … “[Therefore,] Jesus did away with the everlasting character of death so as to make death a thing of time, not of eternity” (The Power of the Cross, St Leo the Great). This is why we cry out Alleluia! The Lord has destroyed and put a limit on our death, thus preparing a place for us with Him for all eternity. This reality, however, calls for a response from me and you. We need to decide if we want to dwell with God for all eternity. Of course we do! The best way to prepare for all eternity is to grow in our love and service of God, one another and especially the needy and poor. If you are joining us at Mass today for the first time, or the first time in a long time, I invite you to get to know our parish community, share your gifts and talents here among us, and grow in holiness alongside us. 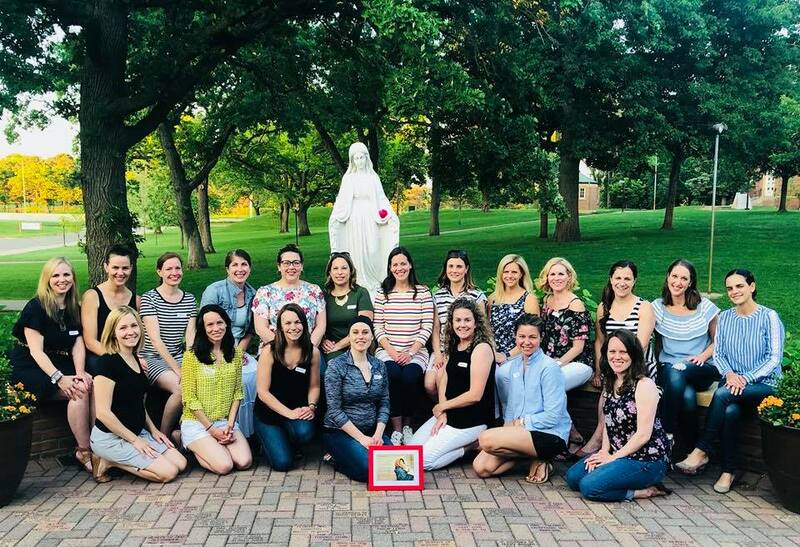 Please contact Janna Davies, Stewardship Coordinator, at 952-929-3317 x9006 or jannadavies@olgparish.org, or visit our website at www.olgparish.org to learn more about Our Lady of Lady of Grace, where we are making Jesus Christ known and loved. Alleluia! This is the day the Lord has made, let us rejoice and be glad in it! Alleluia! One of the tangible and beautiful things about our Holy Week liturgies are the symbols that are used to highlight certain aspects of the liturgy and to draw responses from us on a deeper lever. Symbols can be found in architecture, artwork, manners of dress and objects. They touch us both by their grandeur and, in many cases, their sheer simplicity. The symbols of Easter call us to joy and resurrection! The Easter Fire. Fires were lit before the time of Christ to celebrate the spring equinox, the darkness giving way to the light. Jesus is the Light of the World. He has overcome the darkness once and for all. 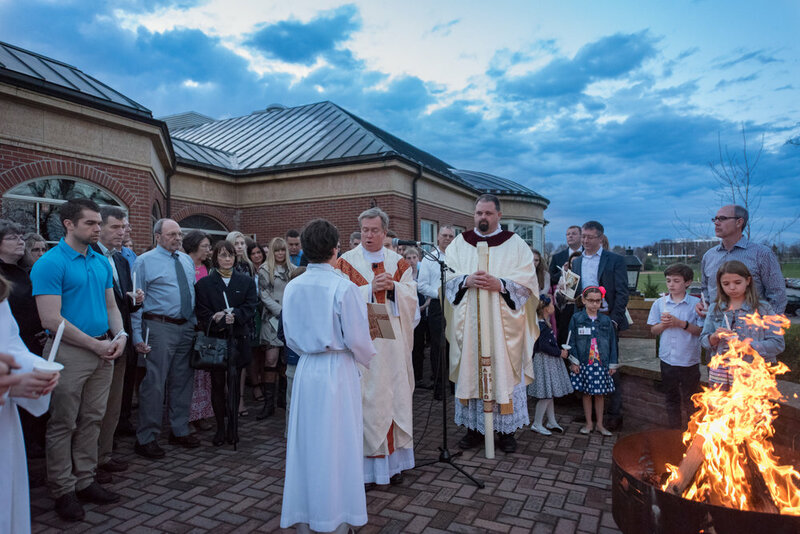 The new fire of the Easter Vigil symbolizes light of Christ coming to dispel the darkness. The Paschal Candle is lit at the Easter Vigil from the “new fire” created each year. It burns throughout the season of Easter in the sanctuary and is also lit at baptisms and funerals, both a sign of the light of Christ and the promise of resurrection. 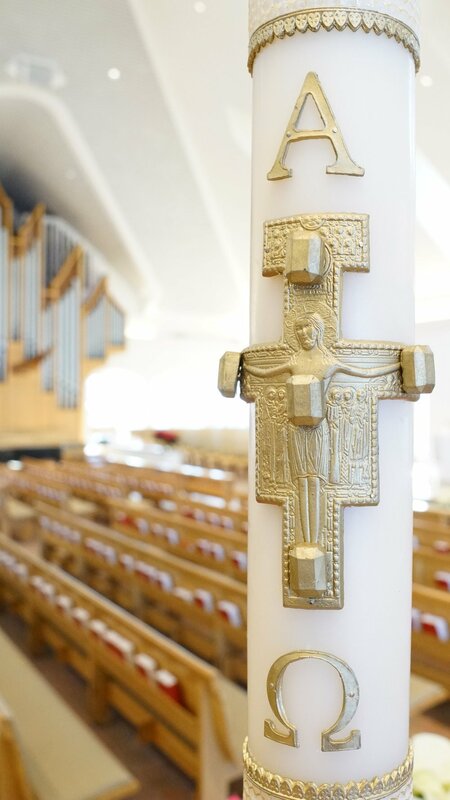 Our Paschal candle is ornamented with beautiful symbols of a fleur-de-lis cross, the ancient symbol of the Holy Trinity. Ornamental bands with bronze medallions of the Agnus Dei and Chi Rho monogram of our Lord are beautifully adorned with bees, a noble symbol of sacrifice celebrated in the Easter Exsultet (a sung hymn of praise.) Take a moment to look closely at the candle. It is not only a strong symbol, but a beautiful piece of artwork. Holy Water. 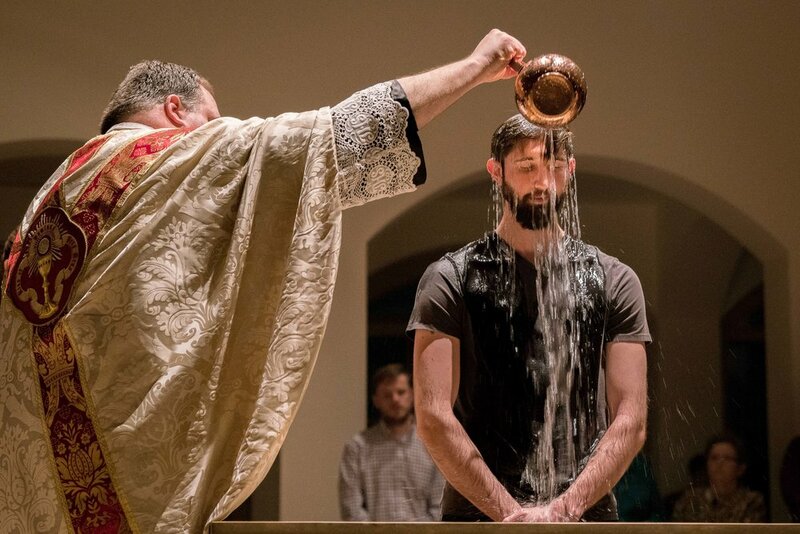 A symbol of baptism, holy water is used throughout the Easter season to remind us of our baptism, and to call to mind our baptismal promises. Colors. The dark, penitential color of purple has given way to the colors of white and gold, fitting for the King of Kings. Palm Branches are used on Palm Sunday signify majesty and victory. for those in the RCIA process this year. Our Lady of Grace Catholic Church Men’s Club (OLGMC) 10th Annual Lenten Fish Fry held on Friday, April 5, 2019, was a tremendous success. The plan was to make it ‘the best fish fry in the Minneapolis/St. Paul metro area’. We were fortunate to host local WCCO-TV Morning News Anchor and food critic Jason DeRusha. He commented: ‘This is crazy huge!’, and then Tweetted at @DeRushaJ: ‘Never seen anything quite like the Lollapalooza of Friday fish fries: freshly battered and fried cod using the @TinFishMpls recipe; 2200 people at the delicious and delightful @OLGSaints in Edina!’ We served a record 2,467 meals which is almost 20% larger than last year’s record, with a shout out to our all-volunteer team led by the OLGMC, OLG Service Club and OLG youth groups. Proceeds from the event support our local OLG youth groups. In addition, the proceeds provided a financial donation of $1,000 in total last year to two charities designated by our OLGMC Fish Fry supplier (Tin Fish); Focus Minnesota and IOCC Disaster Response. "In the evening when I was in my cell," St. Faustina wrote, "I saw the Lord Jesus, clothed in a white garment... Jesus said, paint an image according to the pattern you see with the signature, Jesus I trust in You." 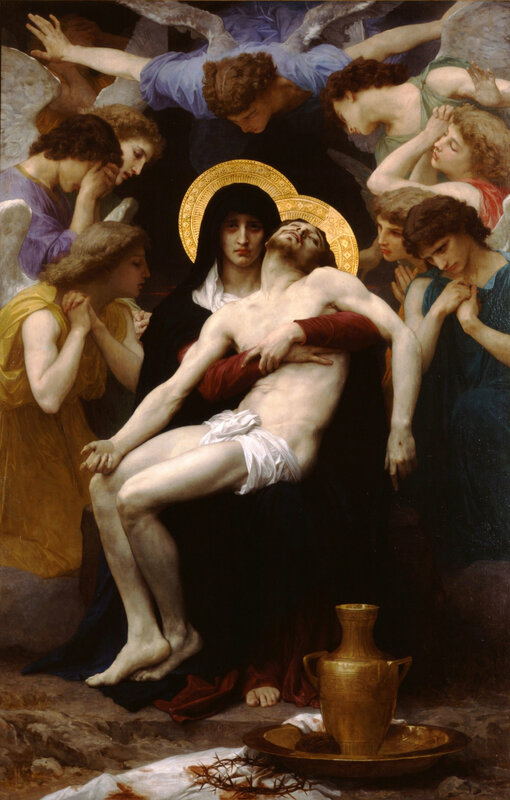 (Diary #47) "I desire that this Image be solemnly blessed on the first Sunday after Easter - The Feast of Mercy." 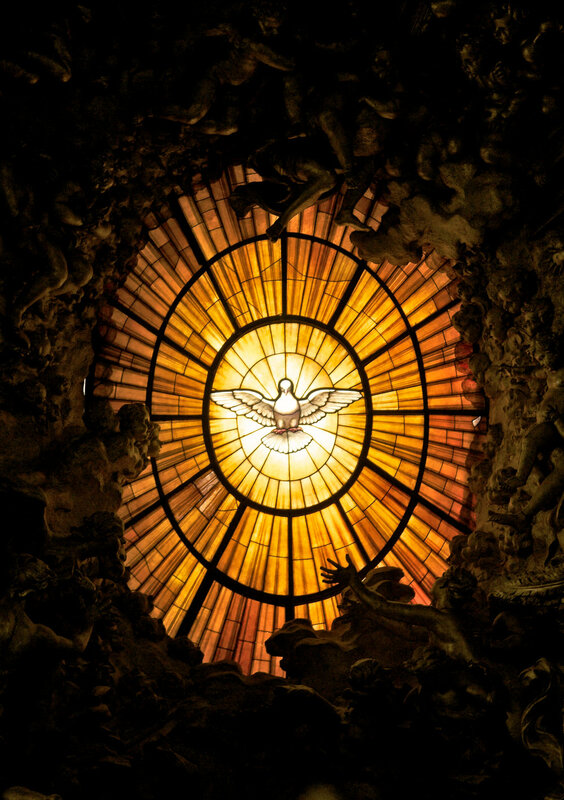 (Diary #49) The two rays are a distinctive feature of this Image of Christ. Jesus explained: "The pale ray stands for the Water which makes souls righteous. The red ray stands for the Blood which is the life of soul...Happy is the one who will dwell in their shelter". (Diary #299) By means of this Image I shall be granting many graces to souls; so let every soul have access to it. (Find the Image in the Commons and in the Adoration Chapel) Please join us next Sunday for our Divine Mercy Celebration April 28 at 3:00 PM in the main Church. Refreshments after the Holy Hour. Without a doubt Holy Week is one of the most important moments of celebration in the parish. We live the festivities daily, beginning with early preparations, step by step. You cannot miss the blessing and cheerful procession on Palm Sunday. The live Stations of the Cross are very popular, everyone rising very early to accompany the Lord on Good Friday. The great Easter Vigil is the solemn day of the week, where the church welcomes the Light of Christ and congregates to listen the Word of God and the feast of the new Water. Nobody is left out this week even though some people work more and others less. The essential thing is that Jesus’ Passion and Resurrection do not go unnoticed by anyone. I really like to see the commitment of the people in this time, enjoy faith with the people. 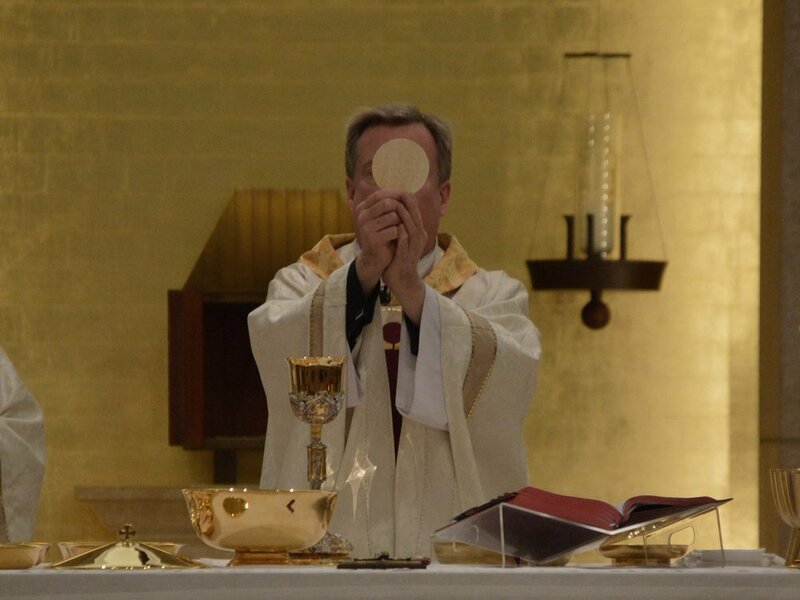 It is a cheerful,beautiful time of renewal, penance and change. We are all tired but satisfied at the end of the week, contemplating God in our lives and experiencing that indeed Jesus Christ has risen and lives among us! Have a happy and blessed Holy Week! The Catholic Communities in Ghana celebrate Easter in grand style, from Palm Sunday through Easter Monday. 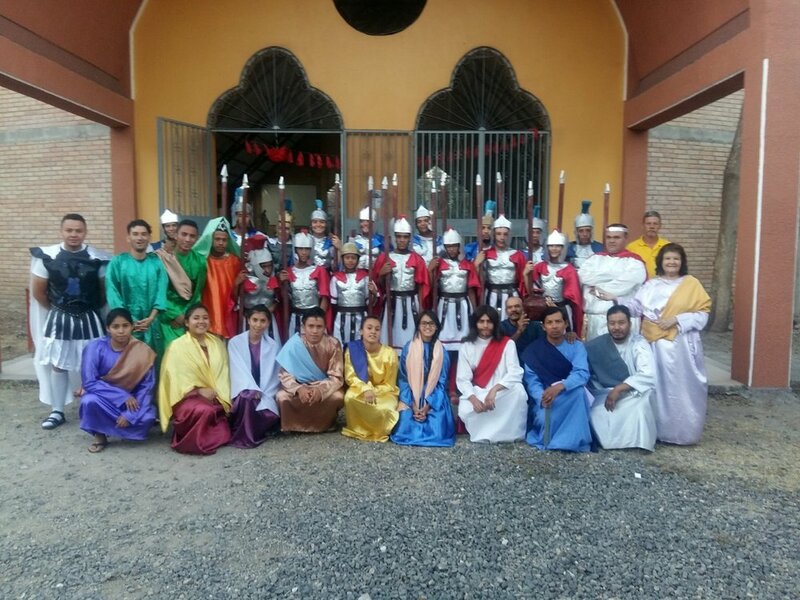 We start on Palm Sunday, when the entire congregation gathers far from the church to begin the procession through the principal streets of the town, with the faithful holding the blessed palms amidst singing , drumming and dancing as Jesus triumphantly enters "Jerusalem." On Good Friday there are Stations of the Cross in the morning until midafternoon. The town is divided into the fourteen Stations. The faithful mourn wearing black and red, with many people stopping whatever they are doing to participate or listen once we get to their suburb. People bring firewood to prepare for the fire in front of the church for Easter Vigil Mass. Most people believe that the ashes drawn from the fire on the night of the vigil of the Risen Lord is a blessing for good farming, so some people collect them and spread them on the farms. On Easter Sunday there is so much joy as we sing and chant our Gloria and Allelluia, dancing to the tunes of resurrection songs of in praise of God for the wonderful thing He has done! Mostly on this day is a mini-harvest held to thank God and raise funds for projects of the Church. In our parish we have the ritual of asking every member to bring some food items or toiletries that could be gathered together to distribute among some extremely needy people. Easter Monday is a day for picnics and fun games, so many churches, groups and societies meet to socialize and have fun. Most times we organize games and most adults get the chance to participate. This is also a day many people do a lot of donations to the less privileged in the society, like orphans. Do you want your child to pray and be close to God but do you find life pretty hectic right now? Hard to find time for your own prayer time let alone family prayer? We feel the same way! 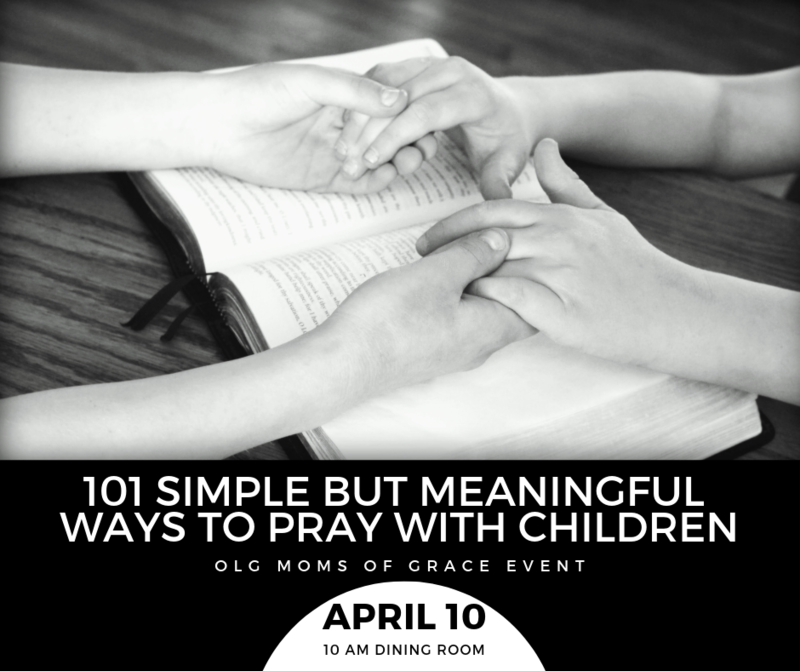 Join us to learn some easy ways to pray with children and leave with a list of 101+ ideas for your home. Bring your prayer ideas too. We will also have materials to create your own set of Resurrection Eggs to help your child connect with the story of Jesus. Hope you can join us for this fun-filled morning! The OLG Men’s Choir has been asked to sing at the Diocesan Men’s Conference for Mass. This annual event features Patrick Madrid, Catholic author and radio host, plus Mass with Bishop Cozzens and dynamic breakout sessions. This year’s focus is “Arming Men of Integrity”. For more information, the schedule of events and to register, visit www.archspm.org.